Vonette Bright is co-founder of Cru along with her late husband Dr. William R. Bright. She earned her BA in home economics from Texas Women’s University and did graduate work in the field of education at the University of Southern California. Vonette taught in Los Angeles Schools before joining Bill full-time in Campus Crusade. Vonette’s commitment to help reach the world for Christ has fueled a passion for a prayer and desire to help others develop a heart for God. She serves as Chair for The Bright Media Foundation and maintains an amazing schedule from her home in Orlando. Bill and Vonette celebrated 54-1/2 years of marriage prior to Bill’s graduation to heaven in July 2003. Bill and Vonette have 2 married sons and 4 grandchildren. She served for 9 years as chairwoman of the National Day of Prayer Task Force, which encourages citizens to pray for our nation and its leaders on the National Day of Prayer. 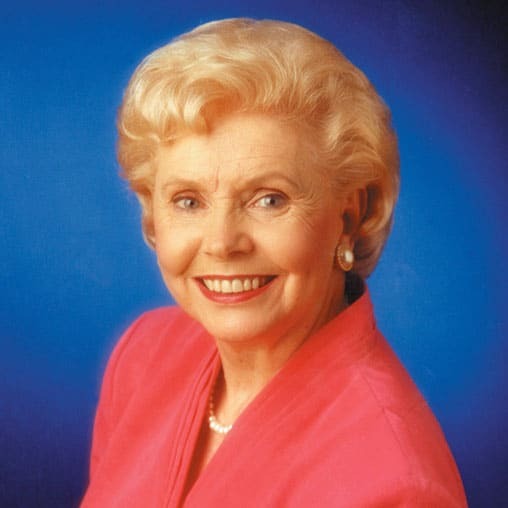 In 1988, as chair, she was successful in introducing legislation unanimously approved by both houses of Congress to make the first Thursday of every May the permanent date for the National Day of Prayer. Vonette currently serves as Chairman Emeritus of the National Prayer Committee. Among her other work, Vonette has authored more than a dozen books, and in 1993, she launched Women Today International, a ministry to and for women. Under her leadership, Women Today is responding to the needs of women to grow in their relationship with Jesus Christ. Currently she can be heard on Christian radio stations throughout the country as she shares her heart and challenges women to take their next step of faith. Join us as we celebrate and remember the goodness of God’s work done in God’s way, in the life of the late Vonette Bright. Join us as we celebrate the life of the late Vonette Bright. It’s never easy losing a spouse, but with God’s grace and help, you can walk through the grief. Vonette Bright talks about her life since her husband, Dr. Bill Bright, died from a pulmonary disease in 2003.